Currently the majority of trips within Greater Manchester are made by private vehicles, yet people do cycle and want to cycle; but all too often when planning networks and new developments cyclists’ needs are not fully considered. It is important as people who want to see more people cycling we raise the voice for cycling in Greater Manchester. One quick thing that people can do is respond to local consultations and there are lots of them active at the moment. I am sure everyone has heard about the Chorlton Cycle way Consultation, which has now been extended until 25 January so that everyone can have a fair say on their view of the plans. But there are a few other consultations that will affect you depending on where you live in Greater Manchester. One thing that affects everyone is where public resources are targeted. 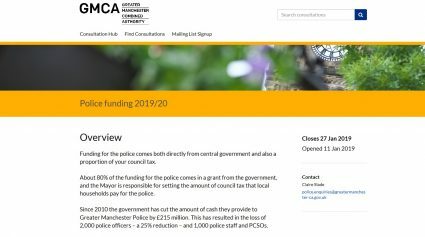 The Greater Manchester Combined Authority is asking for additional funds of £24 per household to fund additional policing. With recent austerity the Greater Manchester Police’s Road Policing unit has been cut from over 100 officers to about 30 officers, this means that there are about 12 officers, in 6 vehicles for the whole of Greater Manchester per shift. The Road Policing unit has to manage everything from the motorways to minor roads, accidents, as well as obstructive vehicles. If GMCA was successful in raising the additional £18 Million funds, would this not be well spent in protecting and making our roads safer? The Consultation can be found here: Police Funding 2019 and is only 3 questions long with a space for additional comments at end. This closes 27 January. 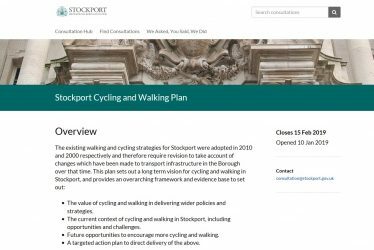 Stockport has lots of potential in providing high quality cycling routes to enable people to make the switch to cycling. 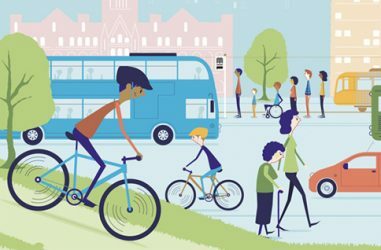 The council’s Cycling and Walking Plan aims to increase the recognition of cycling as an active and healthy lifestyle choice. While it will not provide a complete cycling network overnight it is the first step to creating spaces for people who want to walk or cycle. Transport for Greater Manchester, are drawing up a 5 year plan to improve public transport in the region. 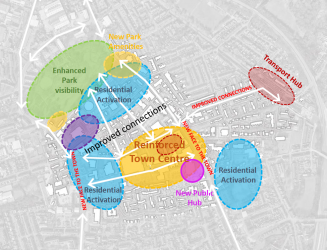 It is important that cycling and walking play a key role in this plan without getting side-lined. If we look to London, we see a pattern for how Manchester might grow in the next 10 years’ time In London trips by private cars have reduced and most journeys are now taken by public transport, with cycling rates doubling in past 5 years. Why do more people cycle? Maybe it is down to the growth in protected cycle lanes which enable people to have greater sense of safety while cycling. There is also the second draft of the Greater Manchester Spatial Frame work. A massive document, that aims to give guidance to the ten Manchester councils on a range of issues such as house building, pollution and transport. If you can read it one sitting you will certainly deserve a medal!